Post nightshift, dragging ourselves out of bed on a few hours sleep, traveling to Edinburgh via train on a rainy Thursday afternoon probably didn’t seem like the greatest of ideas to either of us. Getting on the wrong train because sleepy brains probably seemed like a portent of things to come. But arriving in the city after a couple of beers and seeing the Christmas market was still going, and the lights, and the sights and the sounds lifting moods and put smiles on tired faces. I was stuck for what to get my girlfriend for Christmas but I’m a firm believer in collecting memories not things, so a trip north of the border seemed like a good idea. Arriving Thursday night we dropped off bags and then headed out into the city for food and a Ghost Tour. By a stroke of fluke genius we were the only two on our tour and had the guide all to ourselves. We passed other much larger tours all umbrellas and shouts in Greyfriars Kirkyard, and never had to struggle to hear what was being said or jostle for position. The guide was a fun young guy dressed as Dr. Robert Knox and he took us on a quick overground tour before we headed into the underground vaults. I’ve never been a believer in spirits or spooks but I enjoy the sinister stories and the ‘feel’ of these underground places. My companion, however, is sensitive to these things and found the sensations underground to be troubling. It was creepy, it was spooky, and knowing you’re stood in a place where a family were tortured and murdered to garner a witch’s confession was sobering and atmospheric. From there we toured a few of the pubs on the Royal Mile and took in some ‘traditional’ Scottish music – and some not so traditional gin & tonics and pints of beer. Friday morning and after a late start we tackled Arthur’s Seat. It’s been on my to-do list since I first visited Edinburgh; an ancient, extinct volcano which was active some 355 million years ago. The climb was reasonably easy, and the only real challenge was avoiding as much mud as possible and managing to not slip and be dumped unceremoniously onto one’s bottom. The views from the top are spectacular with the entire city arrayed below and the Firth of Forth clearly visible to the north. We didn’t pause long; it gets chilly at the top in early January, but had plenty of time to snap a string of photos. Despite the inclement weather, slippery surfaces, and ‘quieter’ time of the year, there were plenty of people at the top of the hill. Students, families, kids, dog walkers, and the odd Japanese tourist. It’s seemed like just about anyone could clamber up it’s well-worn paths, as the mini-skirt-clad (clearly not a local) visitor testified. 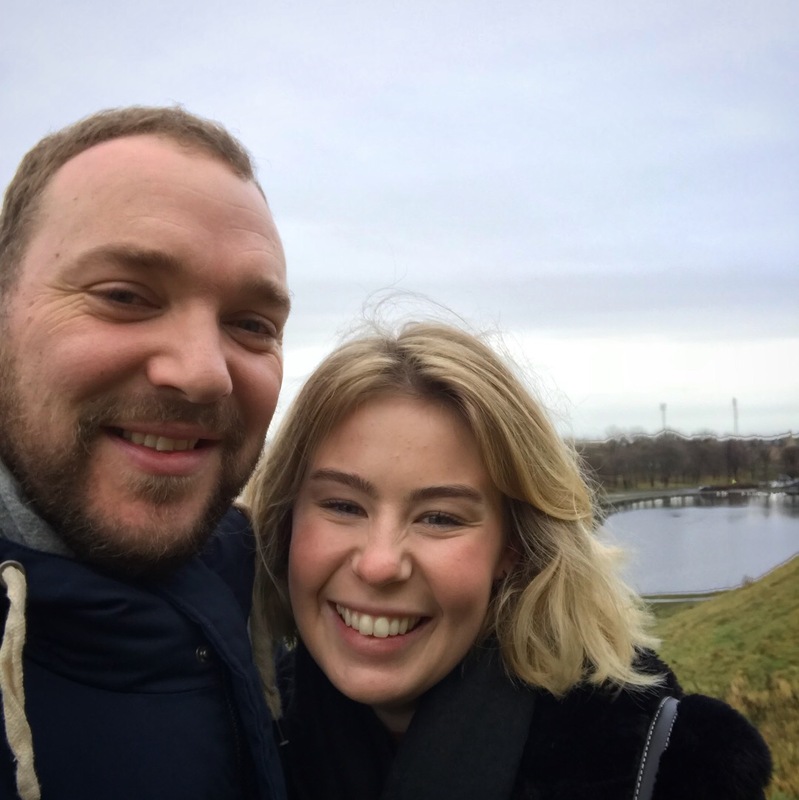 We walked back down in a different direction and took a slow walk around Holyrood Park drinking in the views and fresh air. 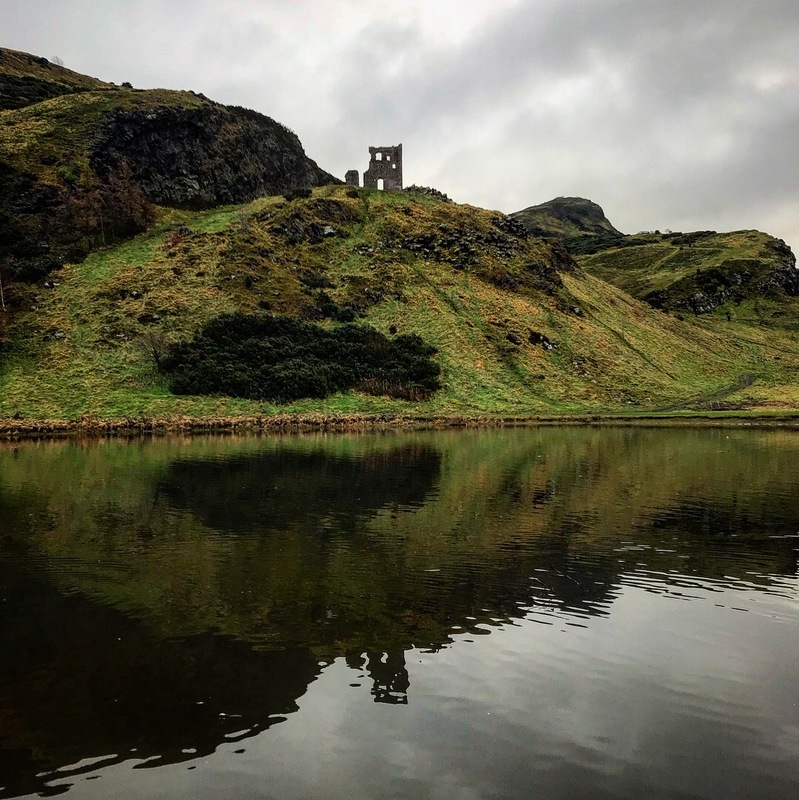 It always pleases me to find these kind of open spaces in the middle of urban sprawl – and with it’s history, pretty scenery, waterways and wildlife, Holyrood didn’t disappoint. I just wish we’d had more time, but a late start and a busy evening planned, and grumbling bellies conspired against us and we called for an Uber to return us to Edinburgh Centre. Friday night I had tickets booked for us to see Shrek at the Edinburgh Playhouse. We arrived in a bit of a rush and managed to grab a beer before heading to our seats in the front row. Close enough to see the sheet music perched upon the keyboard of the band leader. Shrek was brilliant. Donkey was endearing. Lord Farquaad was a riot. Shrek lost none of it’s magic in transition from screen to stage and my girl said it was better than The Lion King on Broadway. It was a heartwarming, funny, feel-good romp and highly recommended. Saturday morning we were both a wee bit worse for wear so opted to don our virtual anoraks and tour the city on a sightseeing bus. We stopped off at the National Museum of Scotland for a look about and a slice of cake. 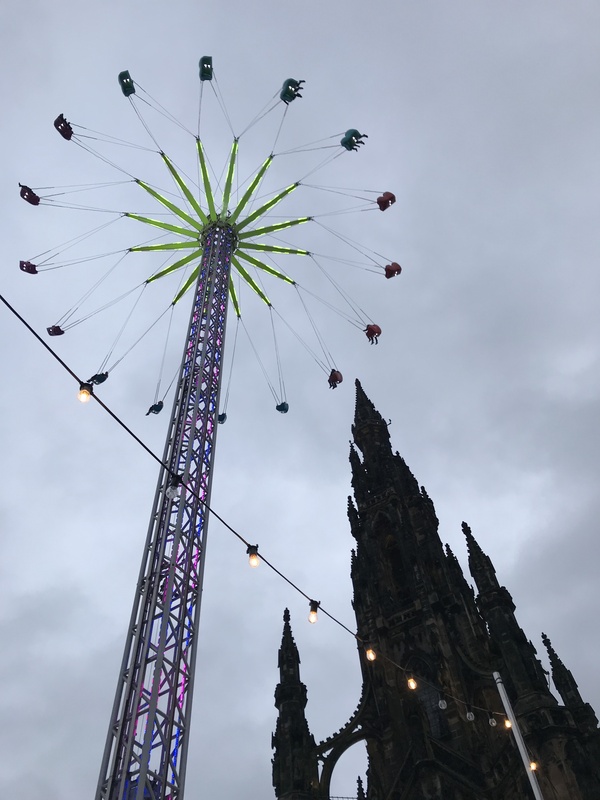 Time was running away from us though, and by the time we got back to Princes Street and made our way to St. Andrews Square, we discovered the ice rink just too late. It was time to head home. Edinburgh, you were outstanding. We shall be back.